Hi there! 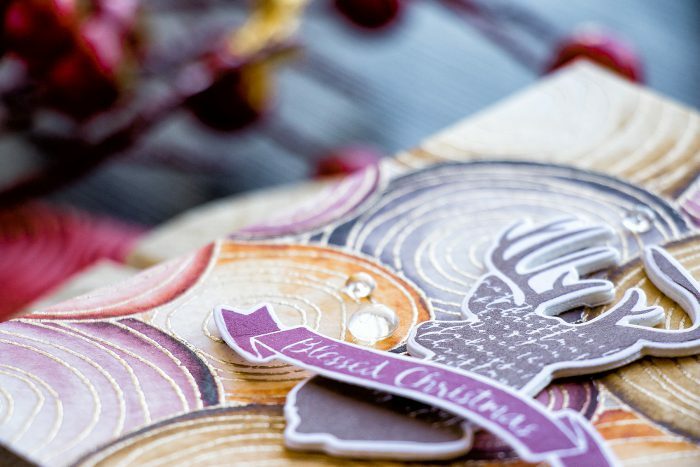 Simon Says Stamp new Holiday 2016 “Believe In The Season” release is now available for purchase and I couldn’t wait to share a card I made using new stamps. It feels likes I shared many-many Christmas cards on my blog already, but none that would truly work great for guys. So I’m sharing one masculine Christmas card today. 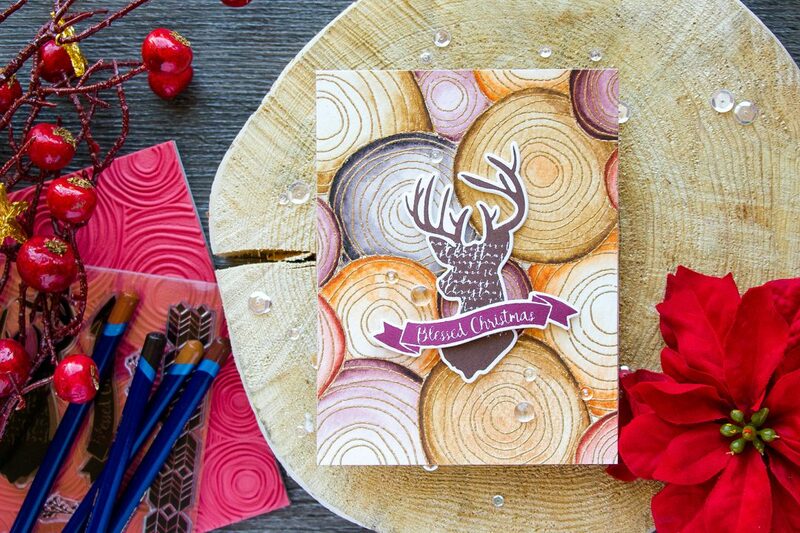 Of course this doesn’t have to be just a Christmas card, by changing out the sentiment this card design (or at least the background) can work great for many other occasions; think birthdays, hunting season etc. Speaking about the background, I used Circle Doodle Background 6×6 stamp and heat embossed it in Simon’s Antique Gold embossing powder onto a sheet of watercolor paper. I love using this particular color of embossing powder as opposed to gold, it has a softer color, I guess. I used Derwent Inktense watercolor pencils to color. I had to go to Pinterest and look up wood slices to get an idea of how to do the coloring, but I was able to figure it out in the end – you start with the darkest, most saturated color on the outer ring and go to lightest, almost white color in the center of each slice. 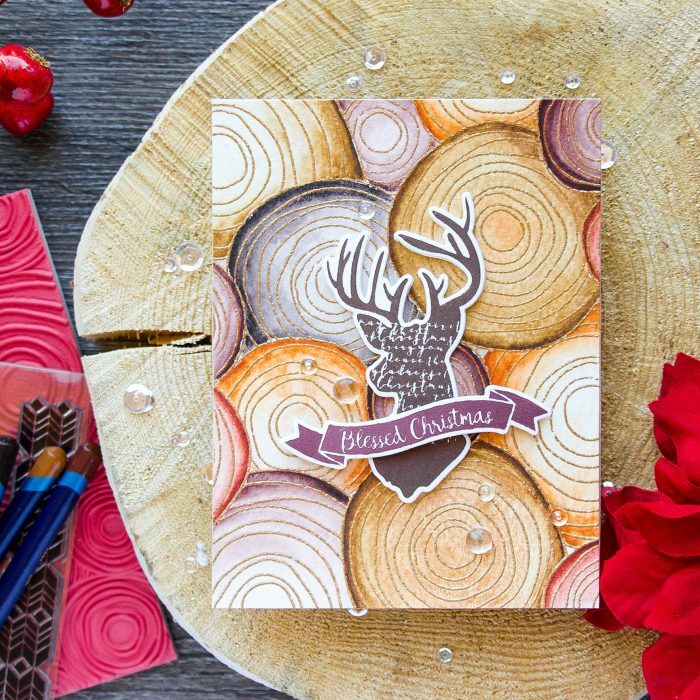 For my focal point I used a deer silhouette image from the Magical Christmas stamp set and stamped it in Dark Chocolate color (such a fantastic rich brown); I also used a banner and stamped that using Simon’s new Merlot ink. My deer was foam mounted with the help of fun foam – I die cut an identical shape out of foam. Lastly, I embellished my card using several small and medium size droplets from Pretty Pink Posh. Wow is the word! Such an amazing card! I see that background name is something about doodling, but from now on I will totally see here wood chunks. You made them so realistic. A great deer as well, classic! Great card and great must have supplies! thank you! the minute I saw this stamp I knew I needed to make it look like wood slices 🙂 such a fun stamp! Wonderful card. Always on the lookout for great masculine cards, this is wonderful. This is just wonderful. I love the colours of your wood slices, they turned out beautiful! Truthfully, I didn’t love the circles stamp… until seeing this card! Before you even said it I thought to myself that it looked like wood slices. The colors you picked were just perfect. Seriously, I think this is one of your most beautiful cards…! awww, thank you so much, Alex! 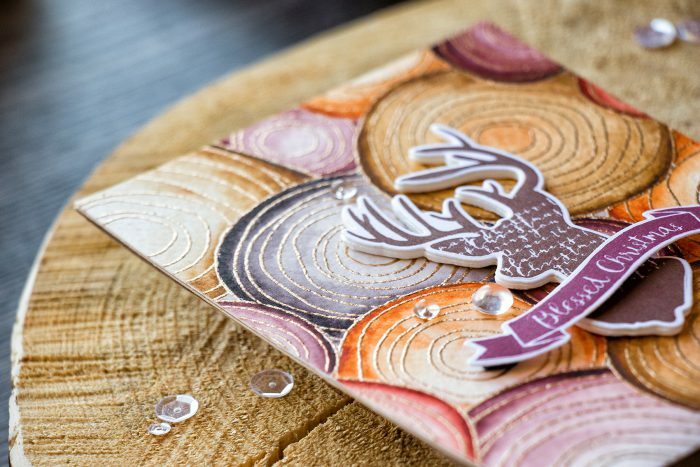 Inspiring use of the embossing folder. Great card. I love how you did the background! Beautiful card. What a great background and card !! Absolutely love the wood lot!! Going to get it for sure! !